As the MONTANE Spine Challenger goes into its first night, Jim Mann (GBR) set a blistering pace to lead the race after the first 4km. Although he initially ran with, current course record holder, Wouter Huitzing (DE), Mann had been the first to break away, setting an incredible pace up Jacob's Ladder to pull away from Huitzing. At the time of writing, Mann is 7km ahead of second place Huitzing, having covered the first 70km in 13 hours (As at 9pm GMT). In 2018, Mann competed in the Ultra-Trail du Mont-Blanc (UTMB), placing 15th over all. Huitzing meanwhile, is the current course record holder coming 1st in the 2018 MONTANE® Spine® Challenger. Simon Bourne (GBR) is currently in third place. Carol Morgan (IRL), an experienced ultrarunner, who previously set the course record for the 2017 MONTANE® Spine® Race, has built a big lead in the women's race despite finding the wind challenging. Jenny Yeo (GBR), is currently second lady in the MONTANE® Spine® Challenger, but only about 5km behind at 8pm GMT. Patricia Patterson (GBR) and Rebecca Lane are too close to call for third place. The MONTANE® Spine® Mountain Rescue Team (MRT) Challenge, which is on the same course as the MONTANE® Spine® Challenger but only open to active Mountain Rescue personnel from England, Wales and the Scottish Borders, is currently led by Joe Farrell (GBR) and in the women’s race, both Ella Corrick (GBR) and Jane Hilton (GBR) are neck and neck. The weather has been mild lower down, but with rain and a cold wind, sometimes gale force on top. 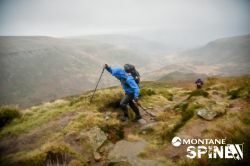 Meanwhile back in Edale, MONTANE® Spine® Racers have been registering for Sunday's race, which starts on Sunday morning. Included in the starting lineup will be 2013 winner Eugeni Roselló Solé (ESP) and Jayson Cavill (GBR), both of them mentioned by Keith to be serious competition for first place. In the women's race, Jasmin Paris (GBR), former national fell running champion and record holder the Bob Graham Round and the Ramsey Round, and winner of the 2016 Sky Runner World Series and 2016 Skyrunning World Championships, will be in a group of 11 athletes racing for first place. The 2018 MONTANE® Spine Race is scheduled to start at 08:00 GMT Sunday, 13 January. As the MONTANE Spine Race enters in second night, an epic contest for lead position is being played out across the Pennines.